As Orange County grows and becomes more populated, traffic congestion has spiked, which increases the risk for pedestrian and bike accidents. According to statistics, the Metro Orlando region consistently ranks as one of the most dangerous cities for pedestrians in the country. That’s one reason why Orange County Mayor Teresa Jacobs recently launched the Walk-Ride-Thrive! program. This pedestrian safety initiative focuses on creating an environment where local residents, businesses and visitors are able to enjoy safe pedestrian and biking options throughout the region. As part of Mayor Jacobs’ Walk-Ride-Thrive! 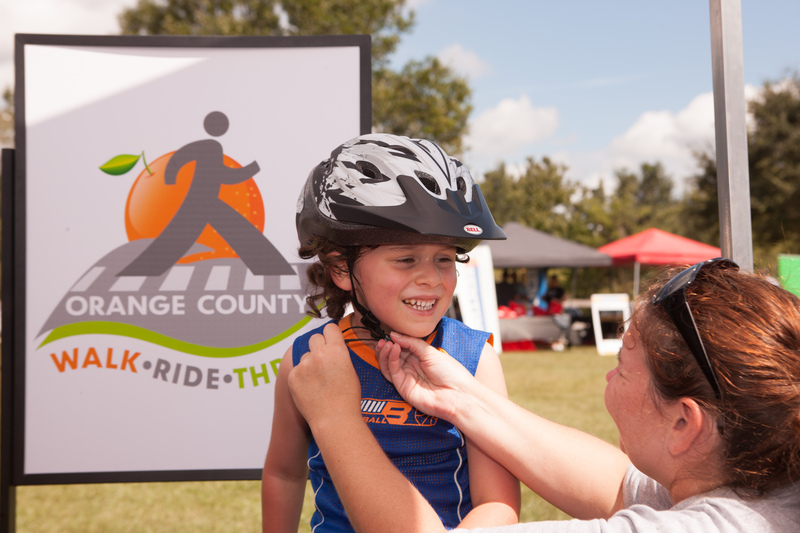 pedestrian safety initiative, Orange County employees are in the community providing free helmets and fittings. According to County officials, ongoing safety initiatives are being implemented to establish and maintain a coordinated, comprehensive and consistent response to Orange County’s pedestrian and bicycle safety issues moving forward. The Walk-Ride-Thrive! initiative will address barriers to making local streets safe and convenient for everyone, improve roadways and complete roadway maintenance to boost pedestrian and bicycle safety, as well as educate and enforce proper road use and behavior by all residents. Over the next five years, $15 million will be allocated locally for pedestrian safety and intersection improvements, providing sidewalks, crosswalks, signals, turn lanes, updated signage and other necessary safety enhancements for citizens. Mayor Jacobs is also participating in the United States Department of Transportation’s Mayor’s Challenge for Safer People, Safer Streets, which aims to make roads more pedestrian and bike-friendly by incorporating safe and convenient walking and biking facilities in transportation projects. Mayor Jacobs is also encouraging local residents and visitors to make pedestrian improvement suggestions by calling 311 or using Orange County’s 311 mobile app. The app allows users to photograph, pinpoint and report problems — such as potholes and cracks in sidewalks — from their smartphone and send the information directly to Orange County’s 311 Service Center.